Winter in Wisconsin has been brutal this winter with sub zero temps. Like -29 and wind chills of up to -50! 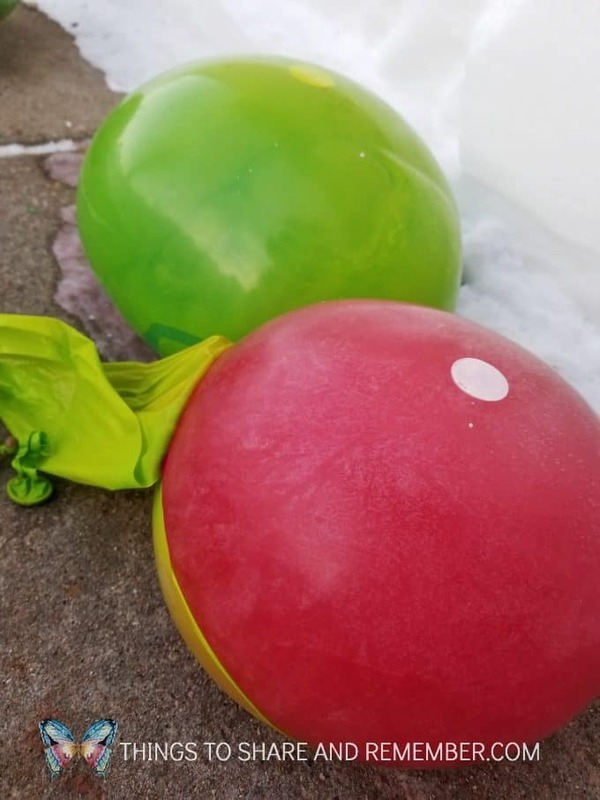 It’s crazy cold so the weather isn’t good for much, except fun experiments like freezing balloons full of water to make frozen ice gems! 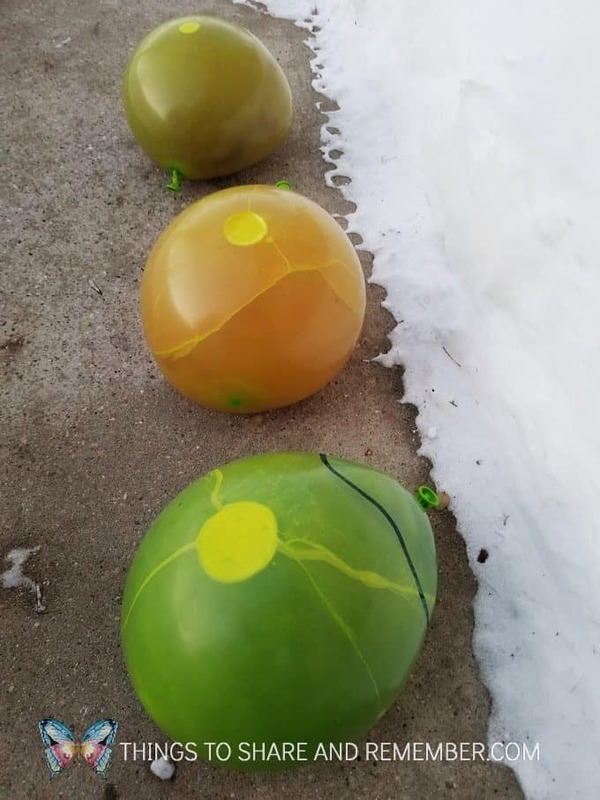 It’s a fun way to make the best of the terrible weather. 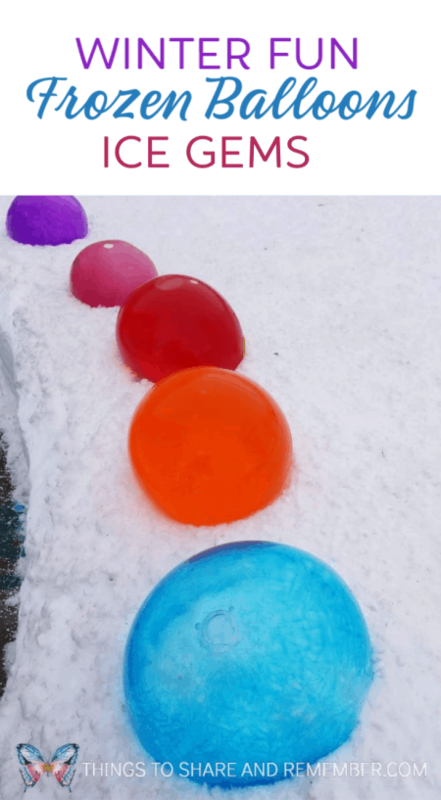 It’s fairly easy to fill and freeze balloons but I have a few tips and tricks to help you since I’ve done this a few times with varying degrees of success. I used Colorations Liquid Watercolors for a variety of vibrant colors. 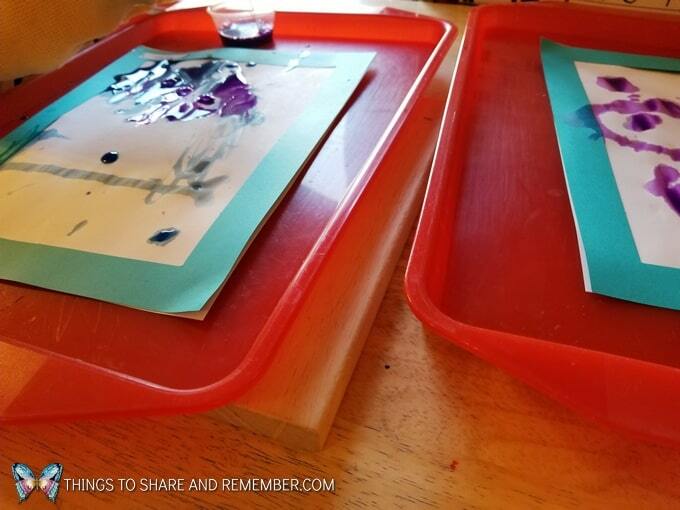 Liquid Watercolors are awesome and have many uses. 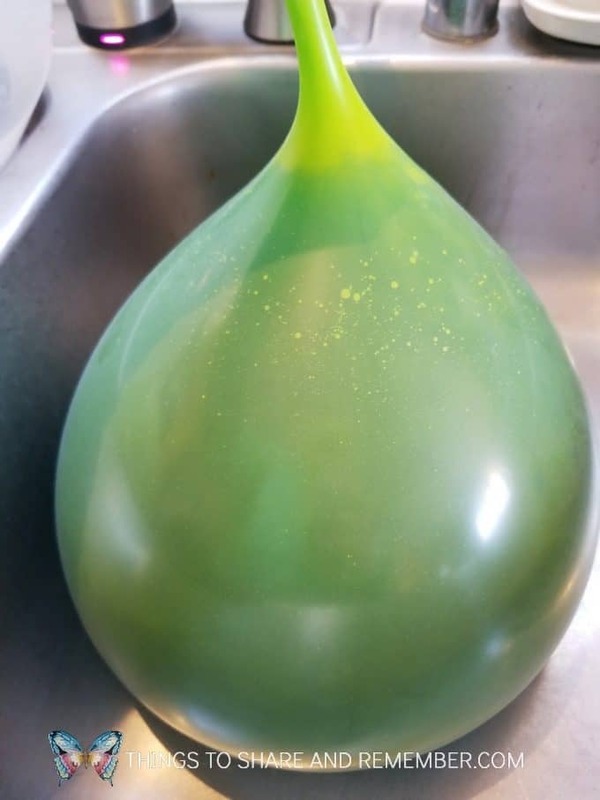 If you prefer, you can also use regular liquid food coloring or the paste or gel food coloring to color your water balloons. 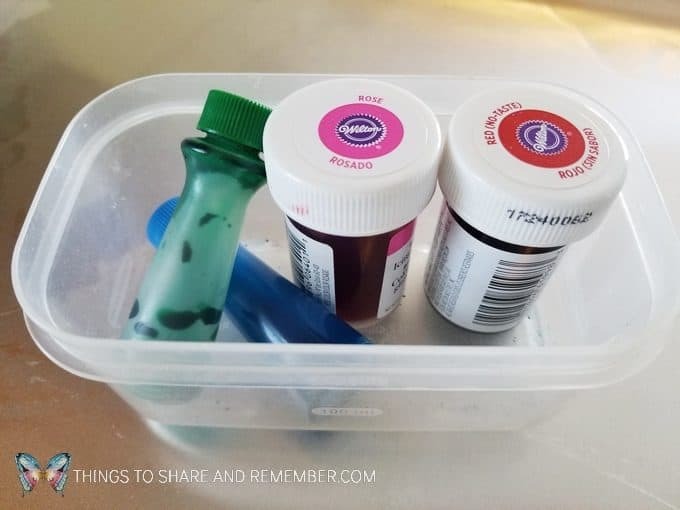 If you use the paste food coloring, mix it in a measuring cup and then pour the coloring into the balloon before you fill it with water. 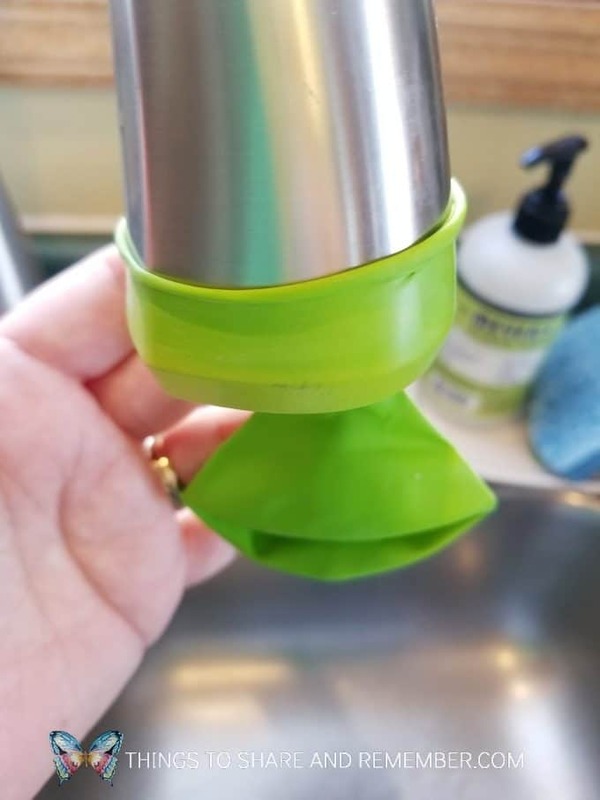 Then stretch the balloon over your faucet. 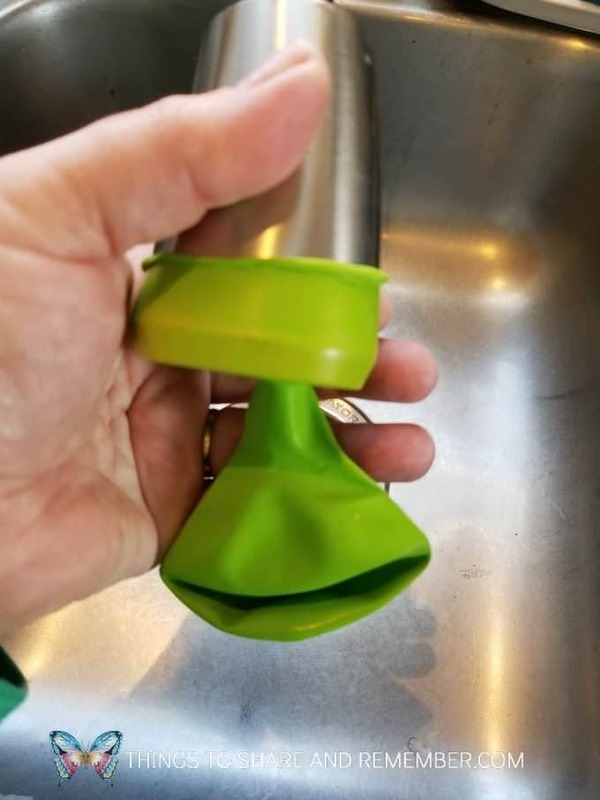 I couldn’t believe this balloon fit around my large faucet but it worked very well. If yours don’t fit your kitchen faucet, try the bathroom faucet as those are usually not as large. 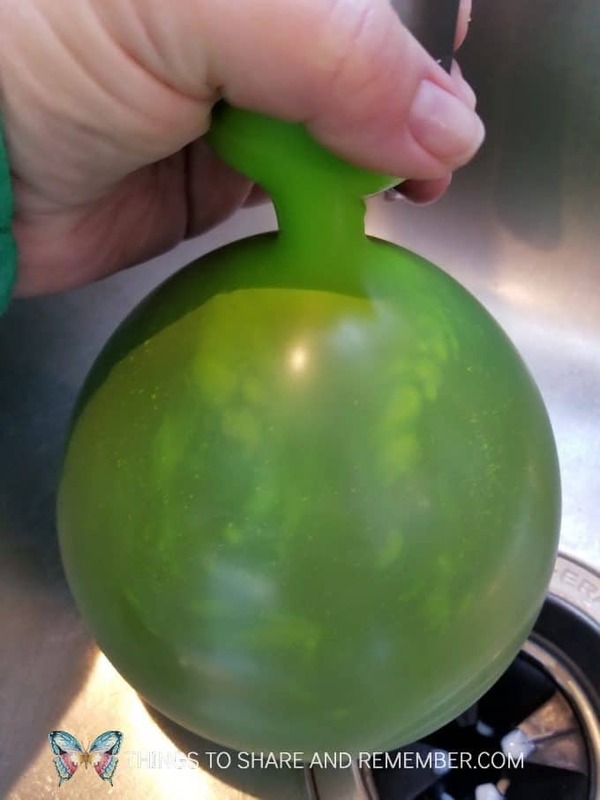 Make sure the balloon is tight and hold on to the top while you fill it to prevent the balloon from popping off. 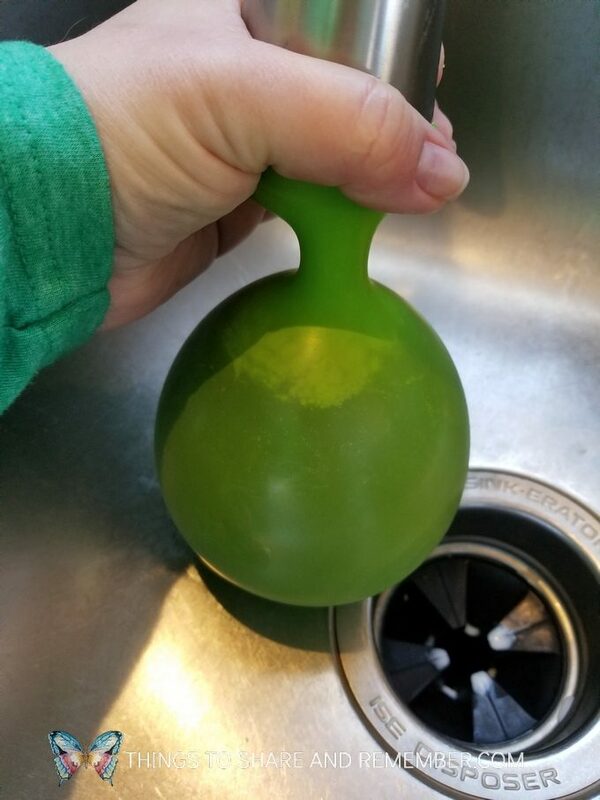 My faucet pulls out so I rested the balloon in the since while it filled. Experiment with how full you want it. 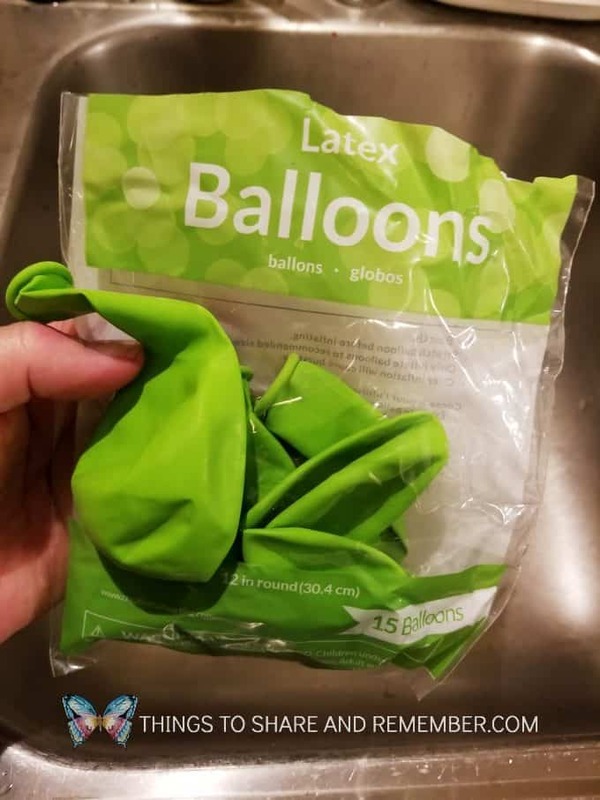 I made mine quite full but it depends on your balloon. 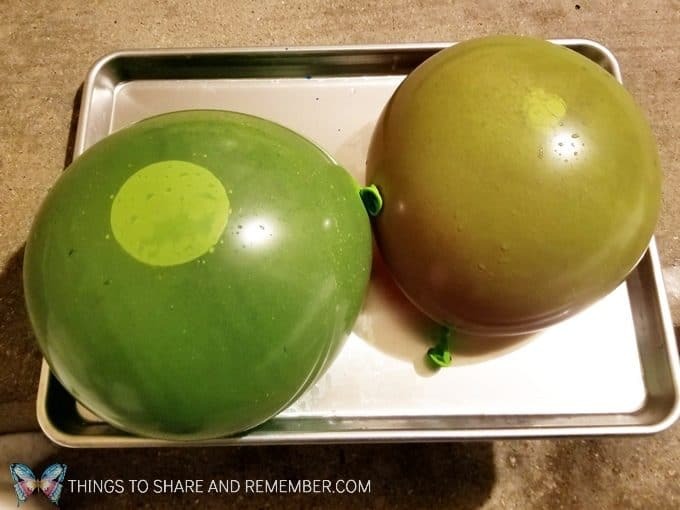 Before trying to carry your water filled balloons outdoors, I would put them on a tray or a cookie sheet. Believe me, you don’t want to drop one in the house! 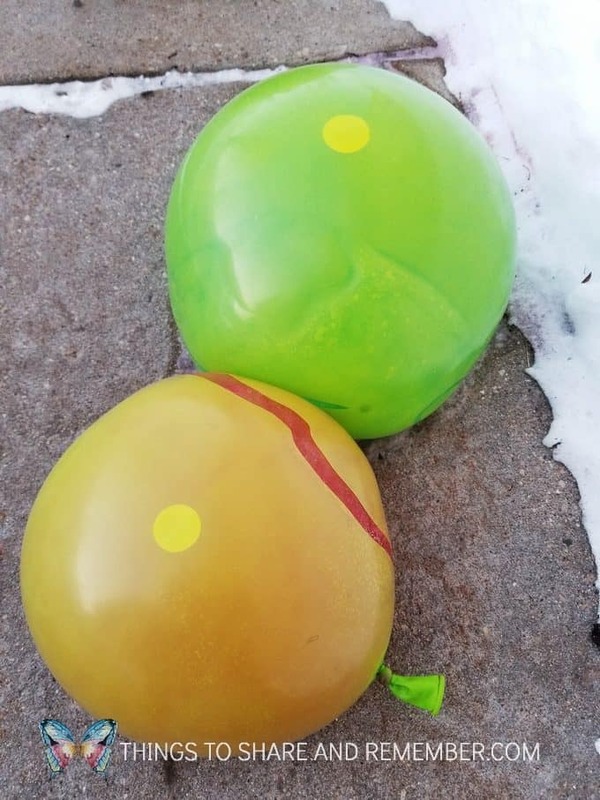 Even if it’s super cold, like -30 degrees, the balloons will not freeze if you put them in a snow bank. 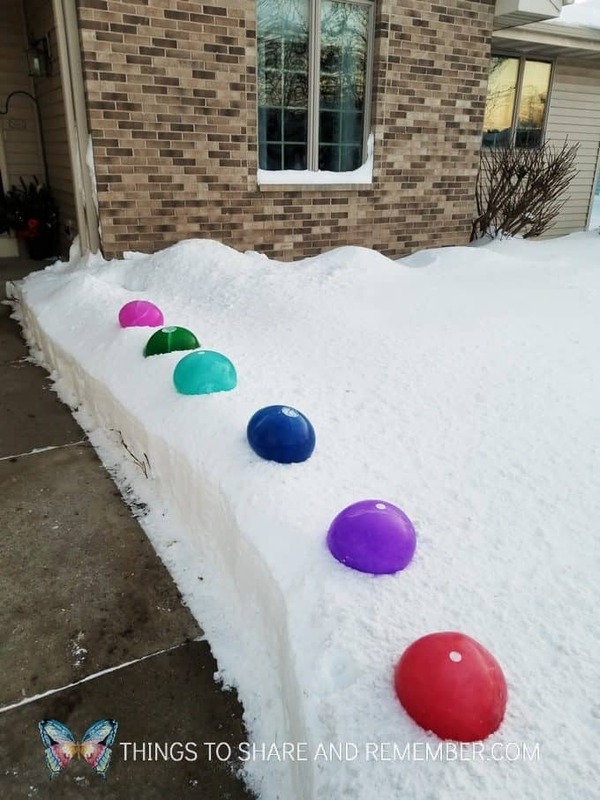 Well, maybe eventually they will, but because snow insulates, it prevents the balloons from freezing. 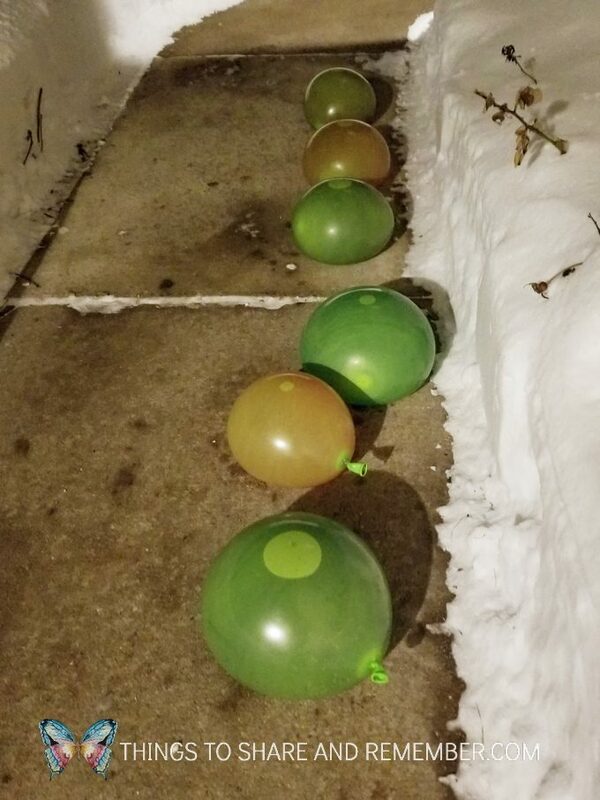 Carefully place the balloons on the sidewalk. Don’t try to move them, they might pop. I’d recommend leaving them out overnight. I timed them during the day and it takes about 8 hours for them to fully freeze. You would think it would be faster when the temps are so severe! 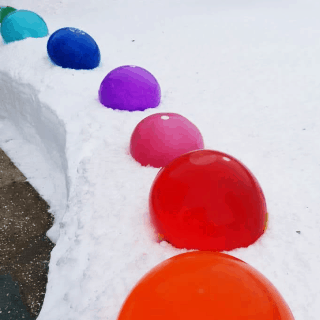 The balloons may split and the ice gems might crack, but they still look cool. 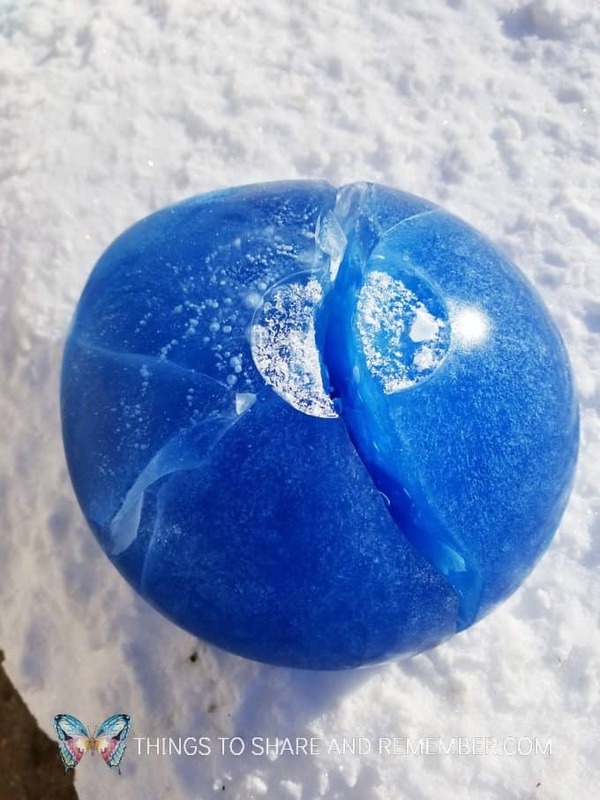 Peel the balloons off the ice gem. 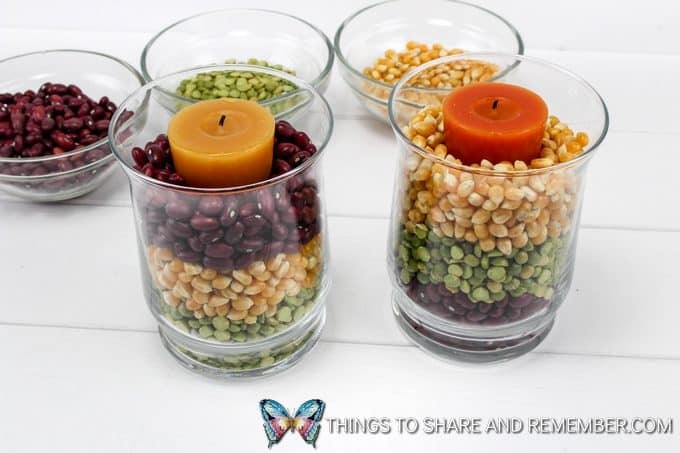 Place them where ever you’d like. 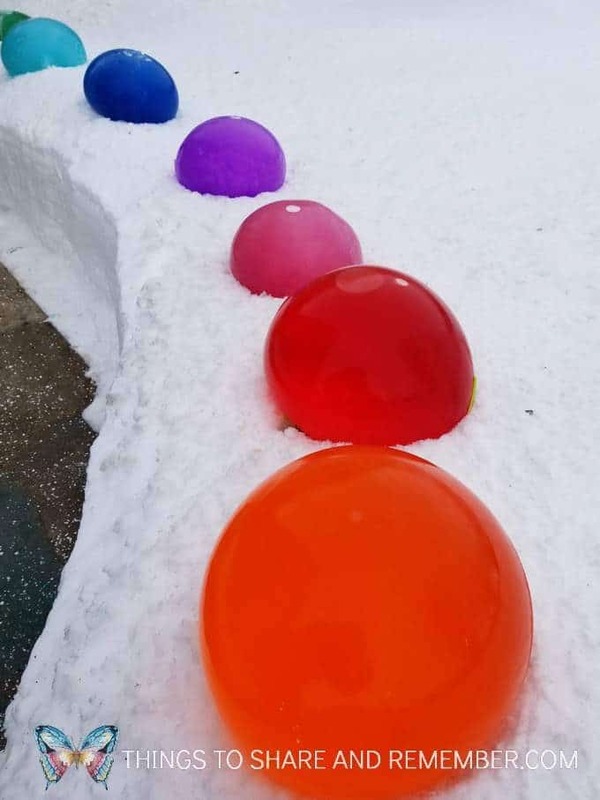 The colored ice gems look awesome in the snow! 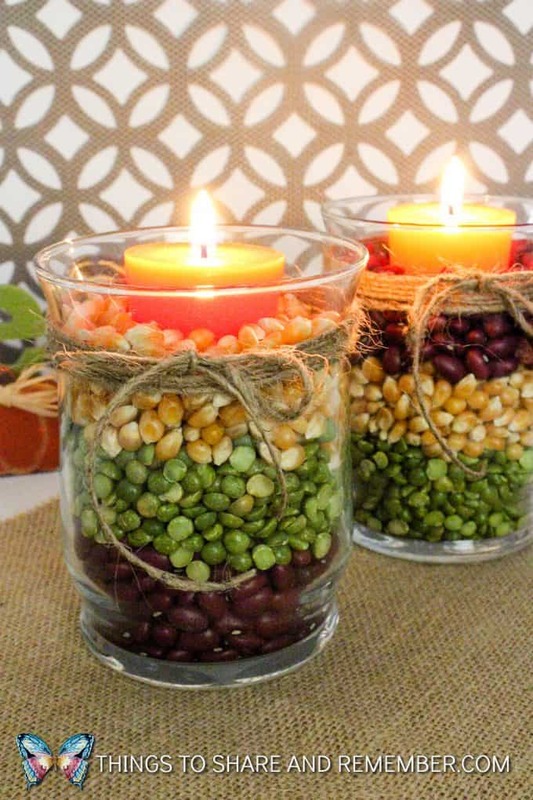 They will last as long as the temps are freezing. The colors shown here were made with liquid watercolors. 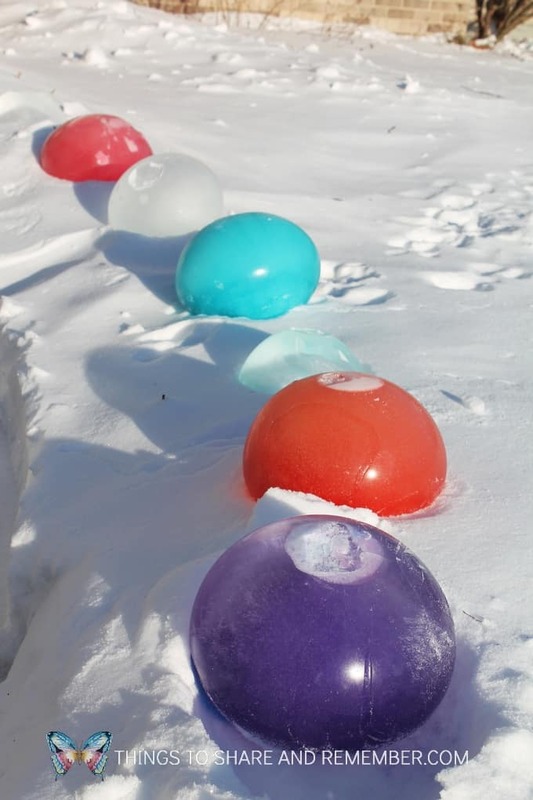 The first two (from the bottom) were made with food coloring. I moved the first three (from the bottom) too soon, so the blue one broke. All that was left was a shell but it still looks neat! 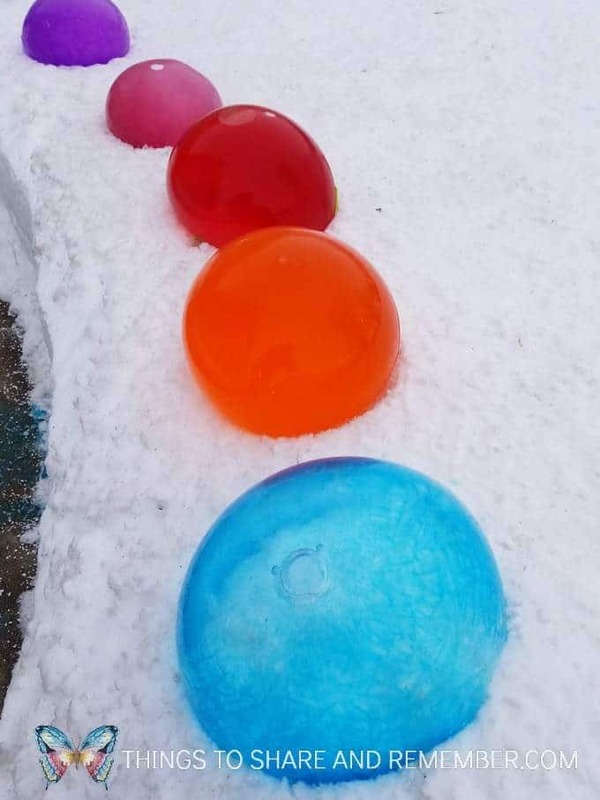 You can see in the picture below that the red one isn’t completely frozen. 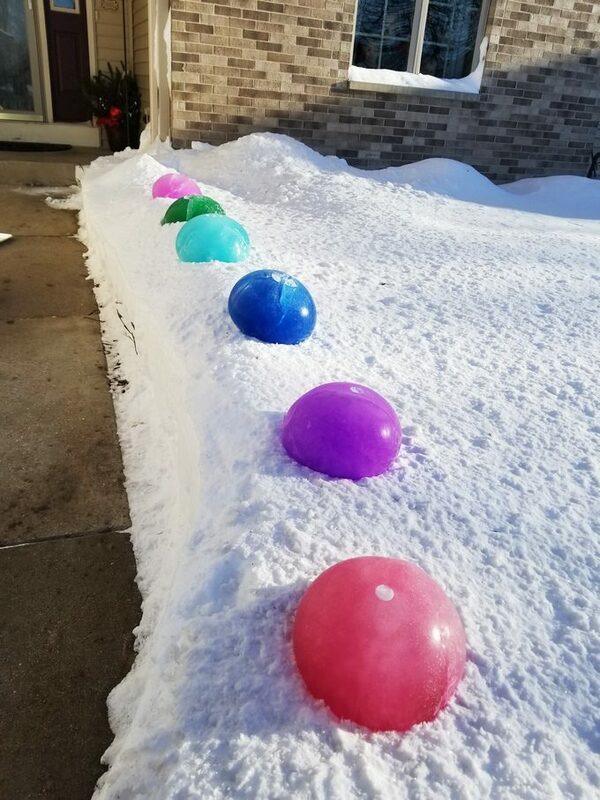 In fact, after I moved the red one from the sidewalk and came into the house, I looked outside a short time later to see this! It wasn’t completely frozen so the water was slowly leaking out from the bottom. It was crazy looking! 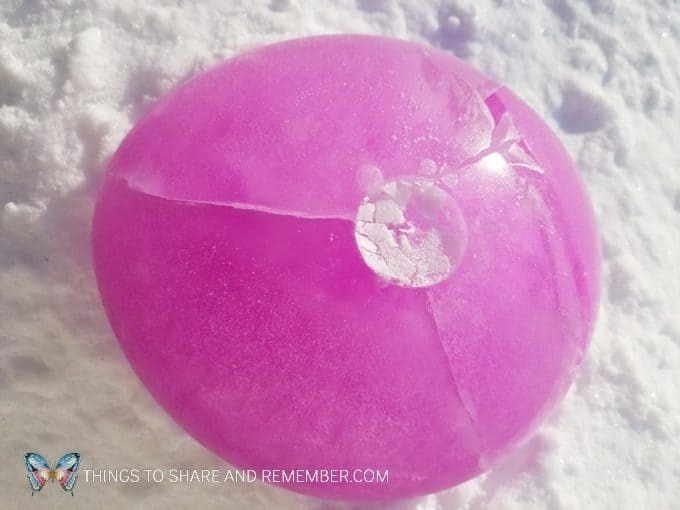 When the balloons freeze, the ice shape may crack. Or they may crack after sitting for a while. They still look amazing! 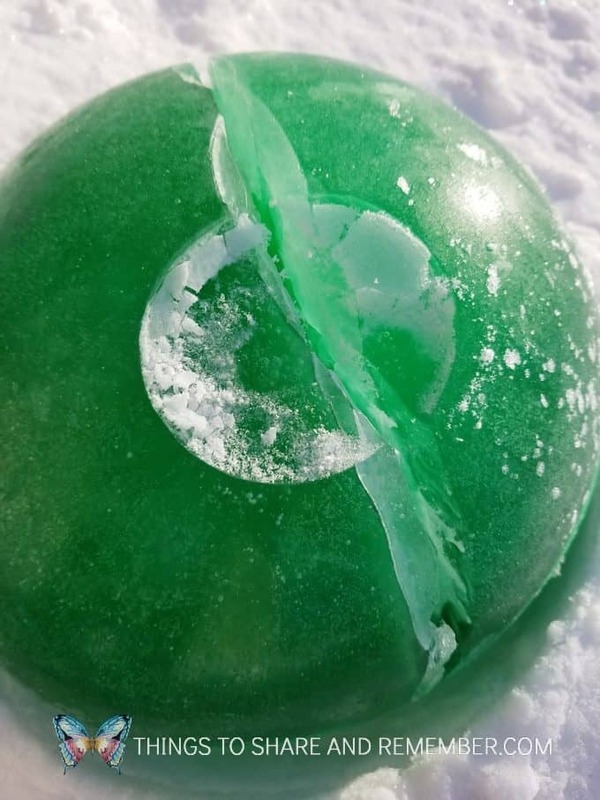 If you try making Frozen Balloons Ice Gems, let me know how it went! 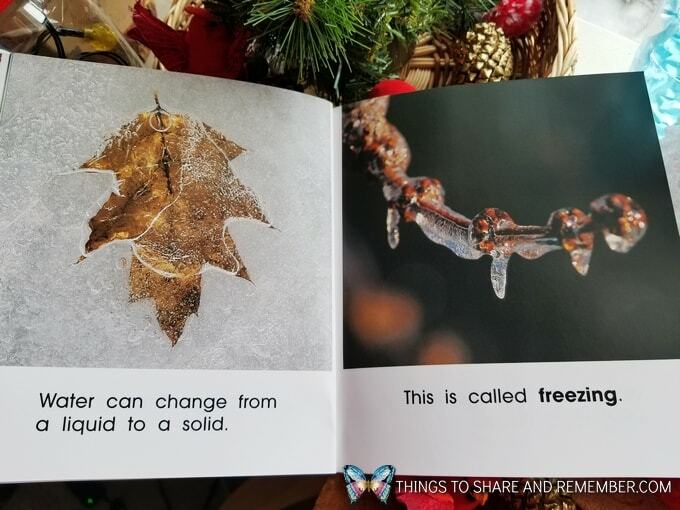 This week we learned about freezing & melting. 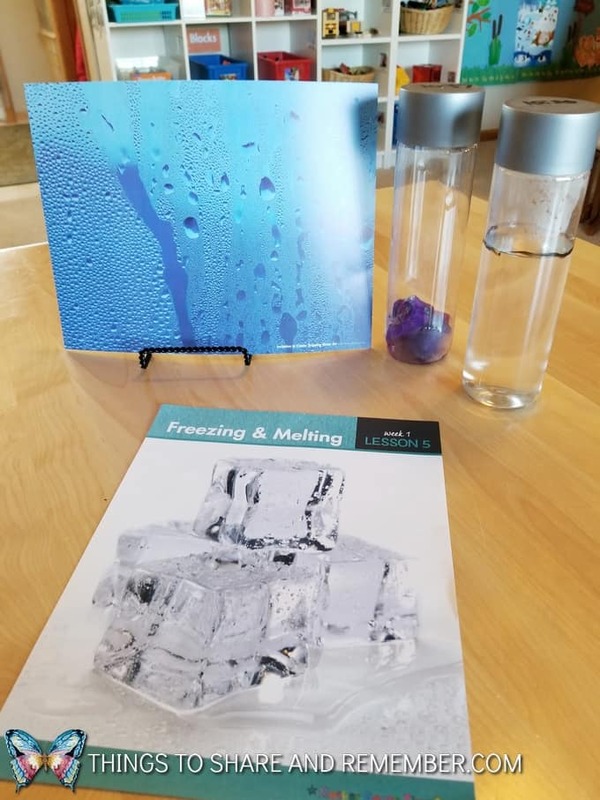 It’s a perfect time of the year for us in Wisconsin to learn about freezing and melting. We’ve had some warm, warm days for November and into December! Like 60° and then back down to 30°! So mostly freezing, but then a little melting too. 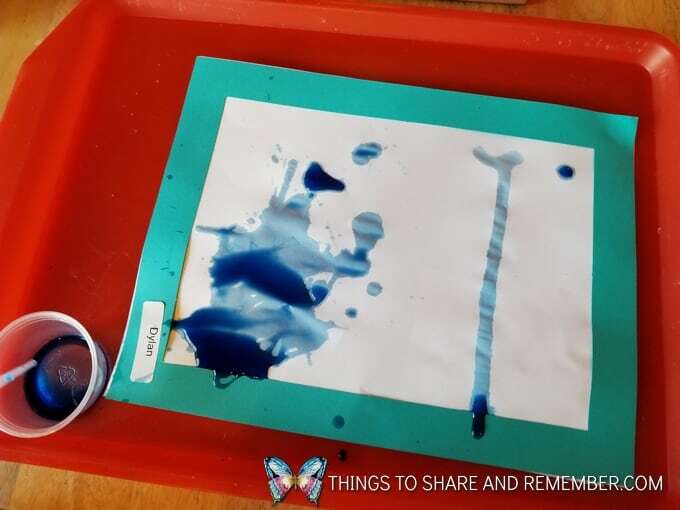 We started with Dripping Water Art. 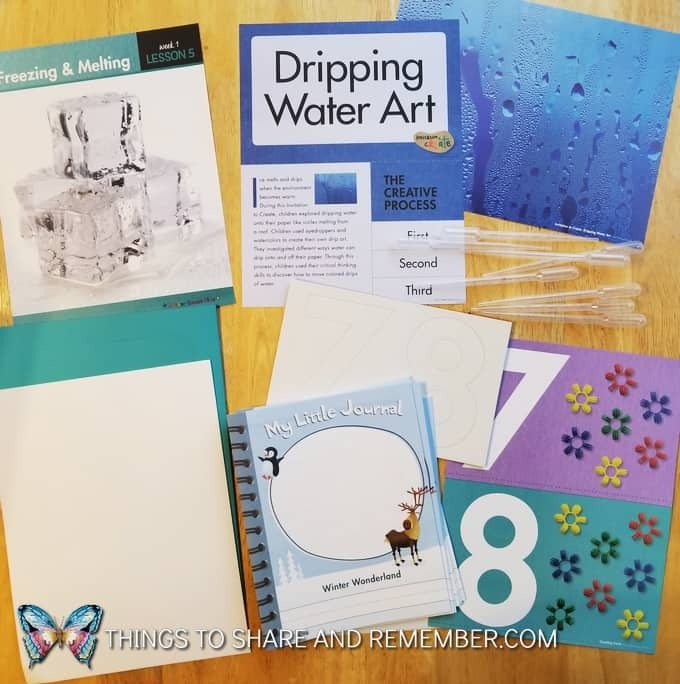 When water melts, it drips. 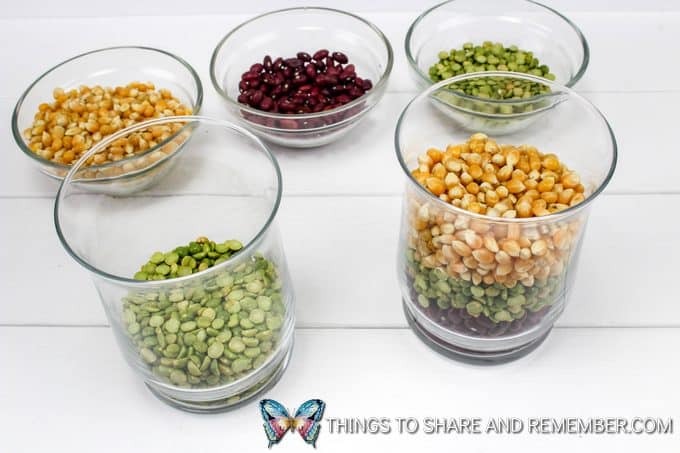 This can be demonstrated by boiling water and collecting the steam and watching the condensation drip down the container. We could actually see this happening on our window, so we went with that. Instead of putting up the large easel, we put blocks under the trays to angle them so the paint would drip on the paper. 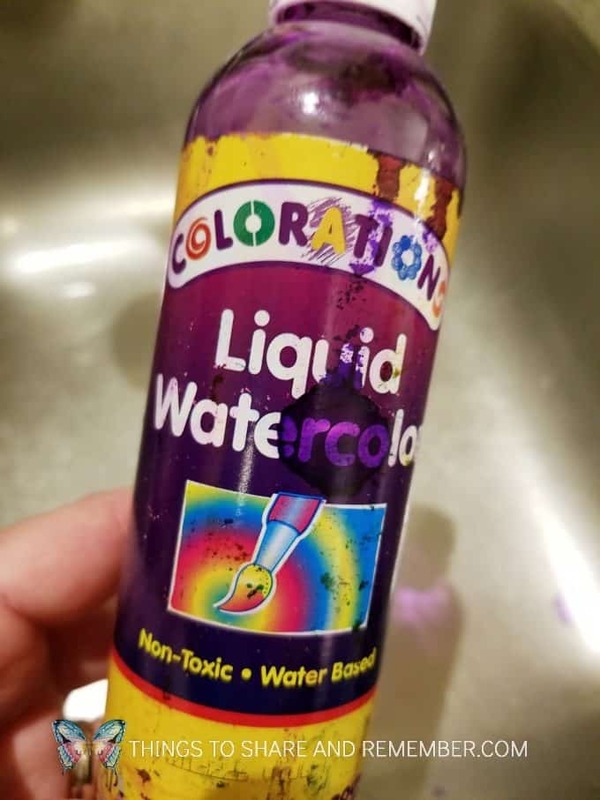 A simple fix that made the watercolor paints really drip! I’m a big believer in using what you have and making what you have work. It’s the name of the game in family child care! 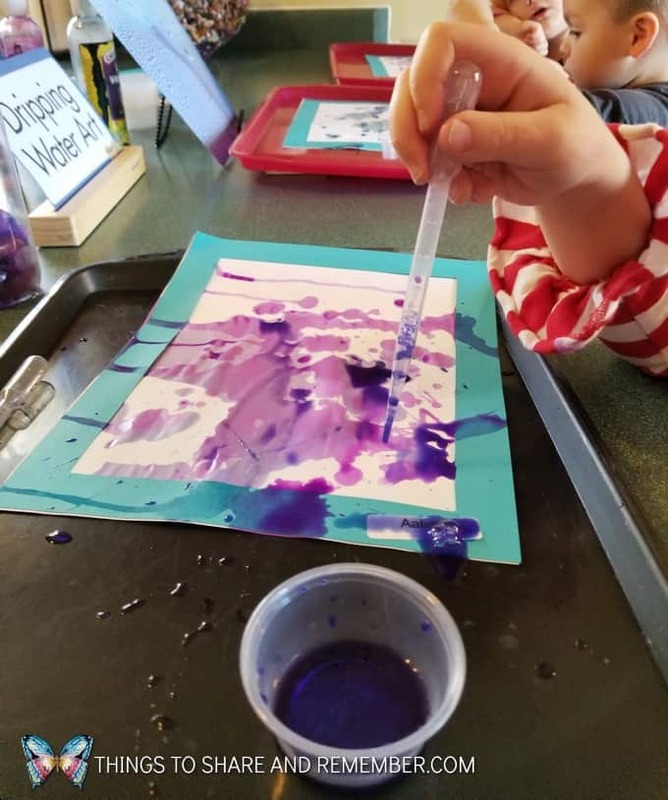 Using liquid watercolors in blue and purple with silver glitter paint mixed in, we squeezed watercolors from pipettes onto our paper and watched it drip. 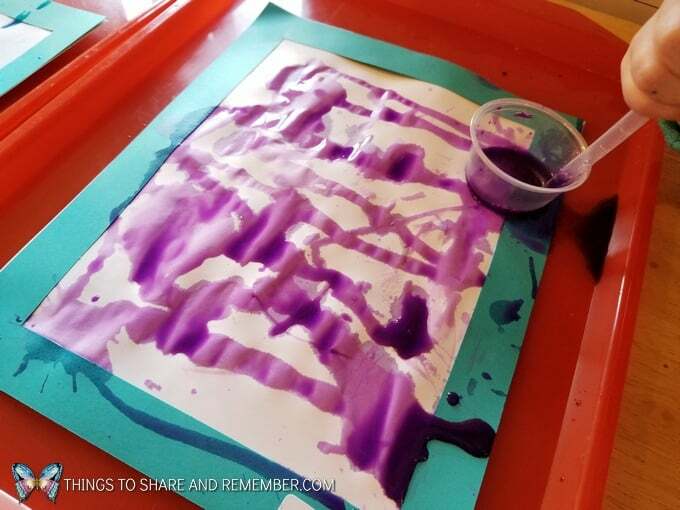 I showed them how they could tilt their trays to make the paint drip even more. 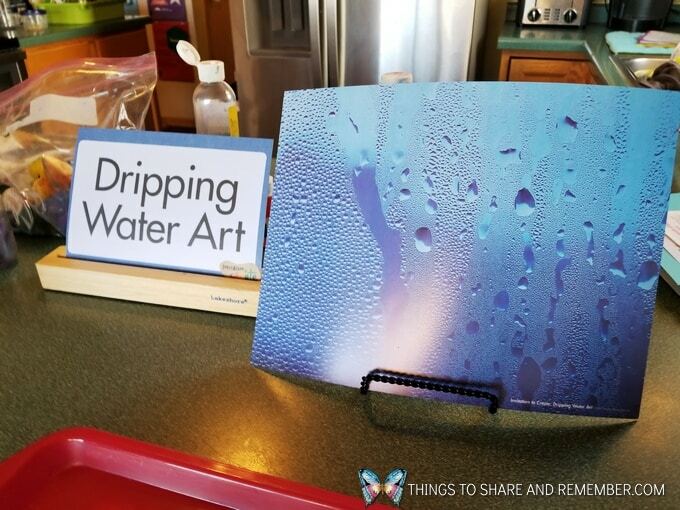 Dripping water makes beautiful designs! 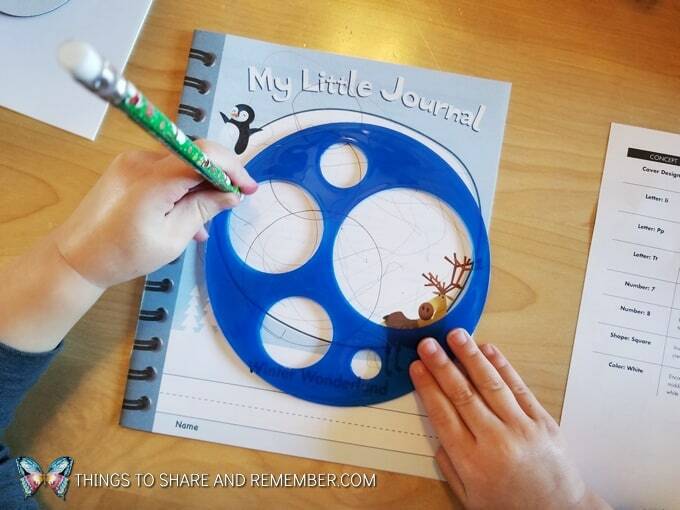 On this day we also started working in our Mother Goose Time My Little Journals. On the front page I encouraged them to draw snowmen. 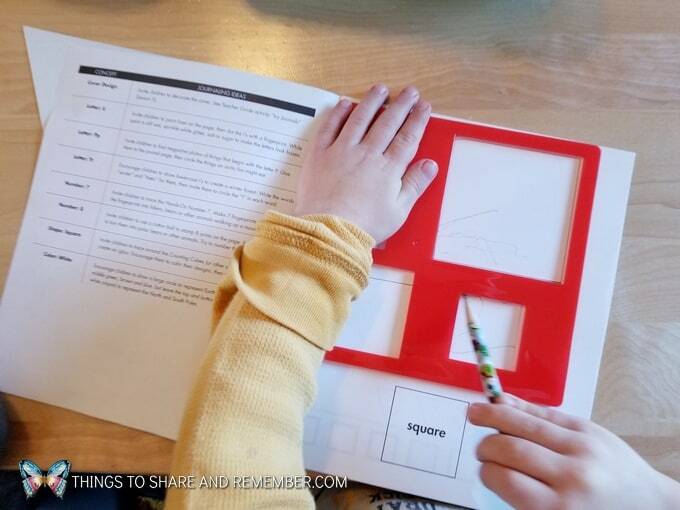 This month our shape is the square so this little guy is using the shape stencils to draw squares. 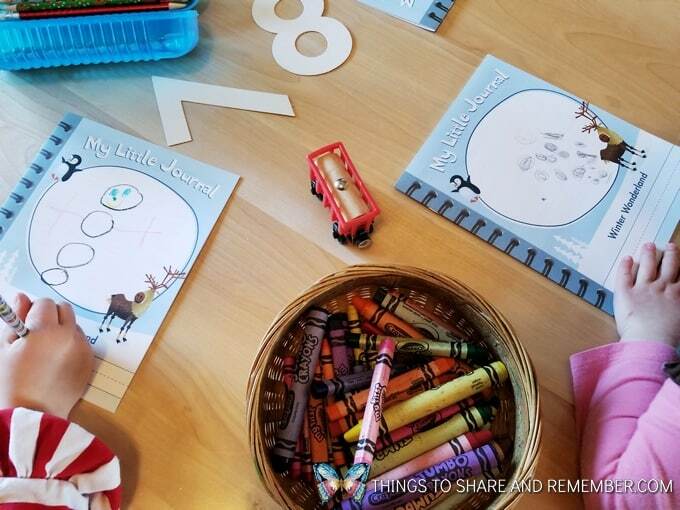 We will be focusing on numbers 7 and 8 this month so she’s tracing number 8 on her page with the hands on numbers from Mother Goose Time. 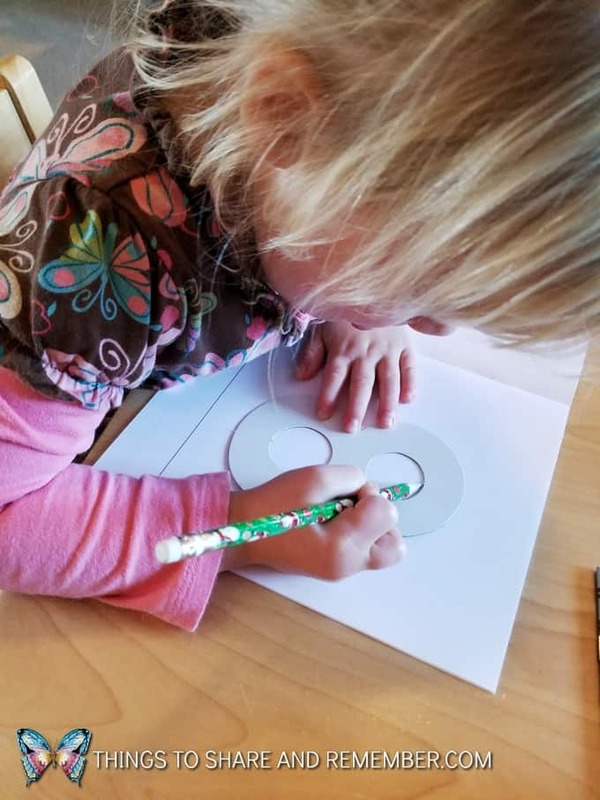 Circle stencils to make a snowman. 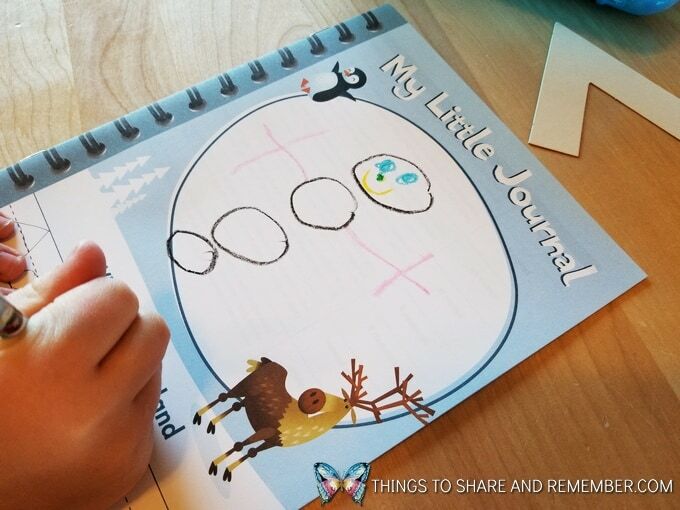 Inside the My Little Journals is a page of prompts for each page but usually, I let my group do what they will in their journals. I make suggestions but as long as they are writing, drawing or coloring, I’m happy! With a mixed age group it’s a bit difficult to get everyone on the same page – literally!! 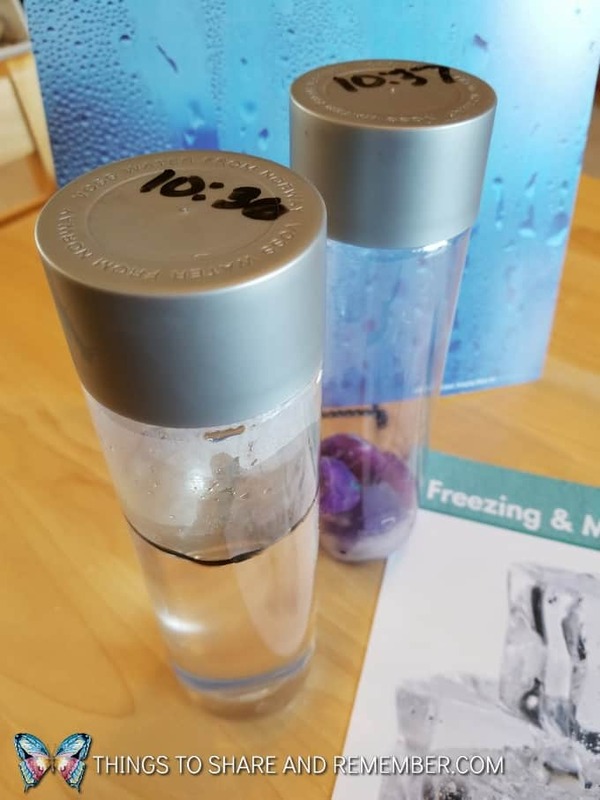 Using a couple empty Voss bottles, we melted and froze some water. I partially filled one bottle with water and marked the level of the water with a dry erase marker. I noted the time on top of the bottle that we put it in the freezer. In the other bottle, we put several frozen watercolor paint ice cubes inside to observe while they melted. 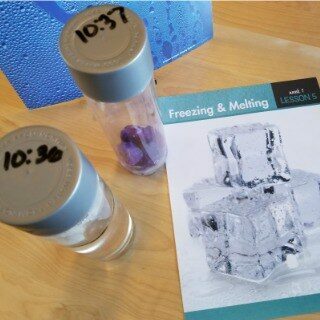 It took about 2.5 hours to melt the ice cubes and around 4 hours to freeze the water. It was fun to open the freezer and check on it! 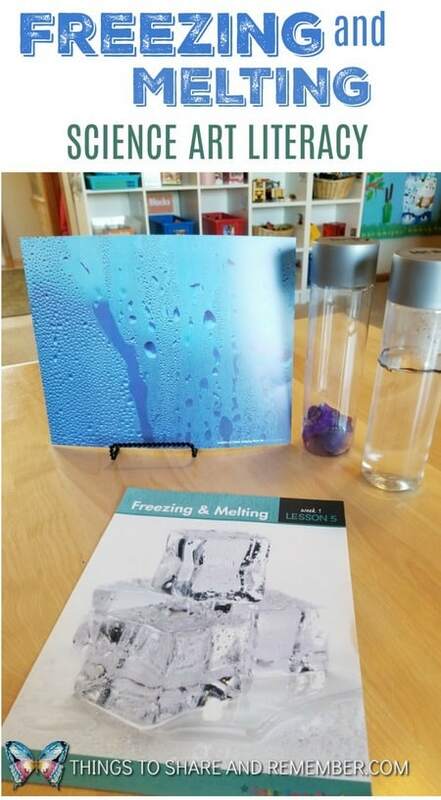 Freezing and Melting is a wonderful book to learn about liquids and solids. 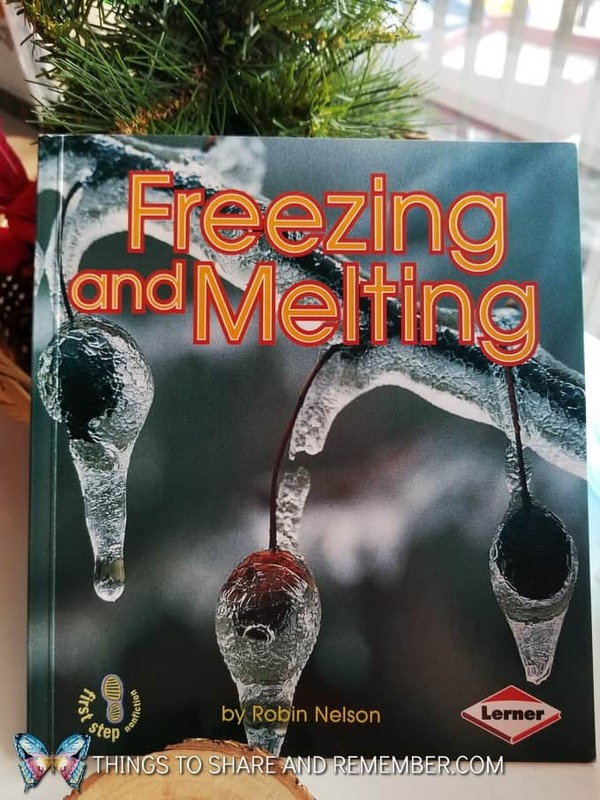 It’s full of terminology and beautiful images that give a close look at freezing and melting. There is an experiment suggestion in the back of the book as well. We went outside and looked for our own examples of freezing and melting. 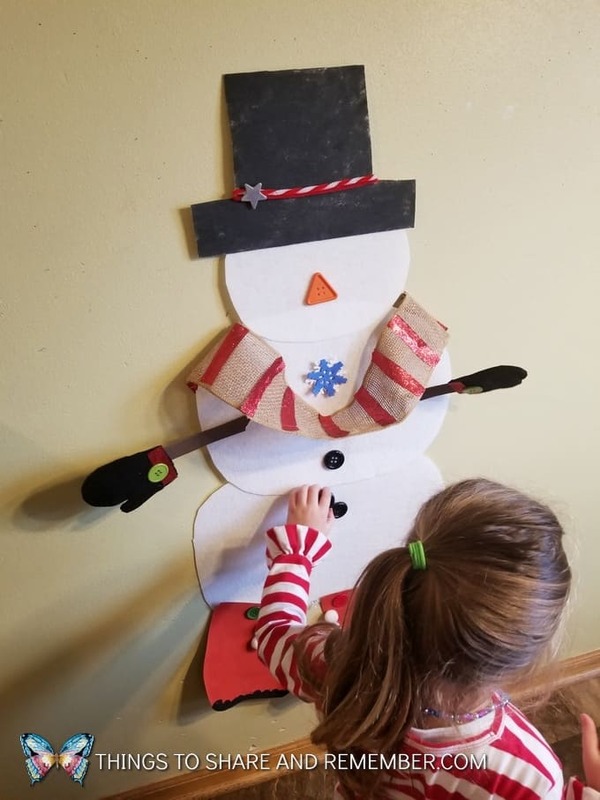 One thing I never really realized until I was an adult and child care provider, attempting to make snowmen with my group was that it takes a special kind of snow to make a snowman. Conditions have to be right – the right amount of moisture in the snow in order for it to stick together. Every snow is not snowman making snow. 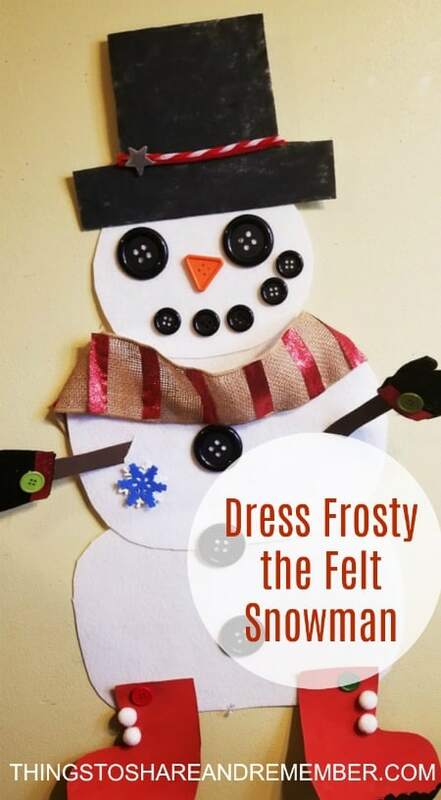 No worries with this one though, you can dress Frosty the felt snowman anytime! 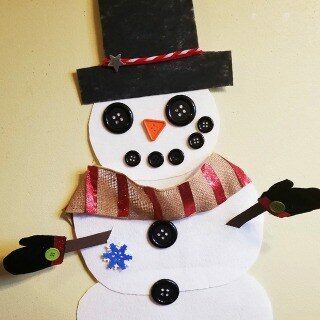 I made Frosty out of felt and random craft supplies I already had except for the snowman button set. 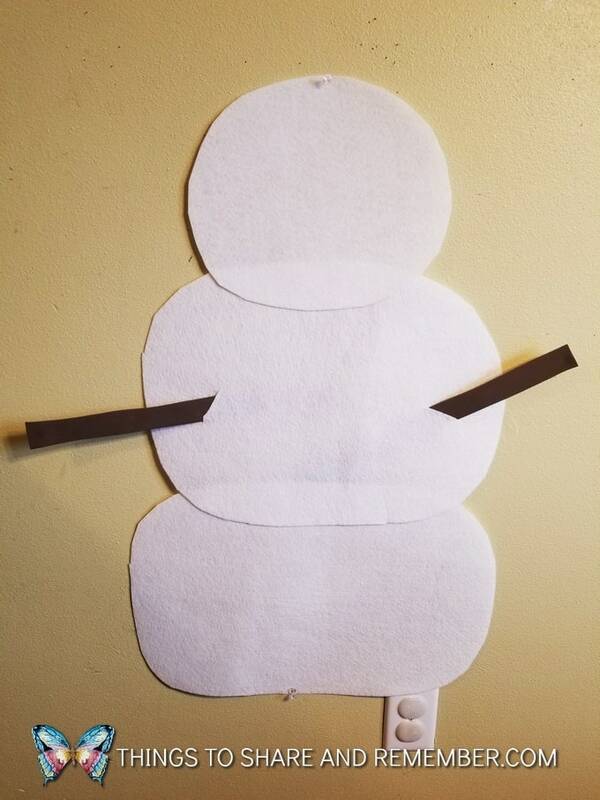 Using the white felt, cut three circles for snowman. 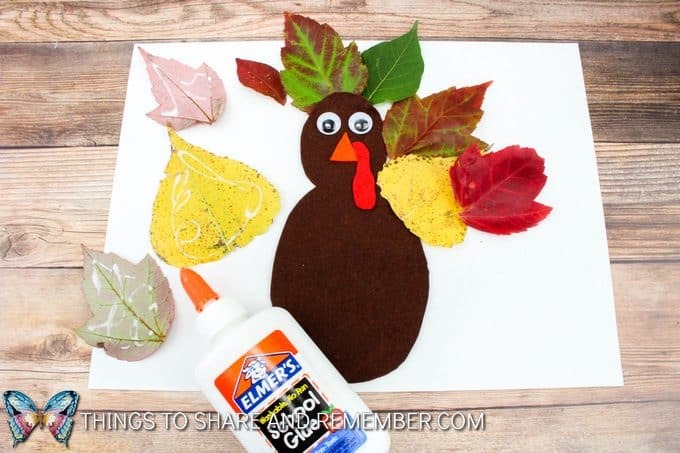 Hot glue together (or leave separate if you want to use the felt pieces on the floor). Cut slits for arms. Tack to wall. With a piece of black craft felt, cut a hat shape and paint black (or use white felt and paint black). Embellish as desired. Add a strip of the rough side of Velcro to back of hat. 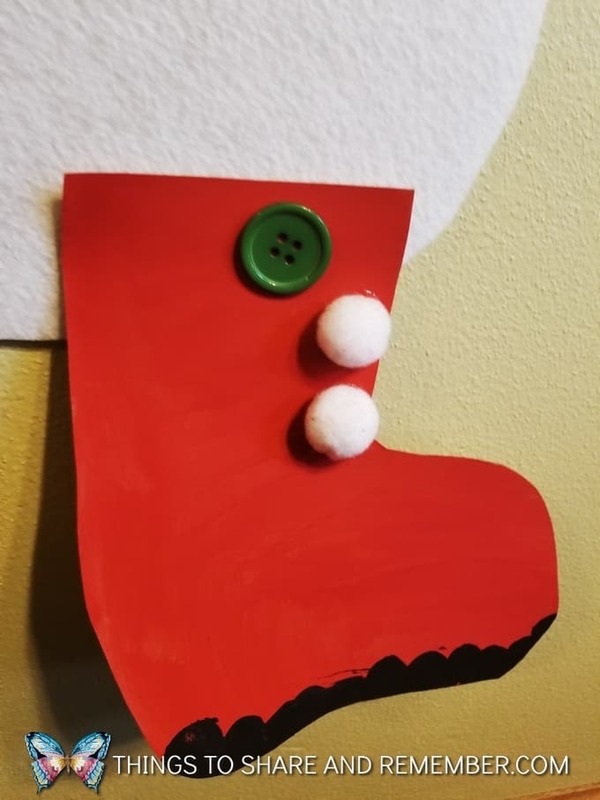 Cut boot shapes from cardboard, paint and embellish. Add a strip of the rough side of Velcro to back to the top of each boot. 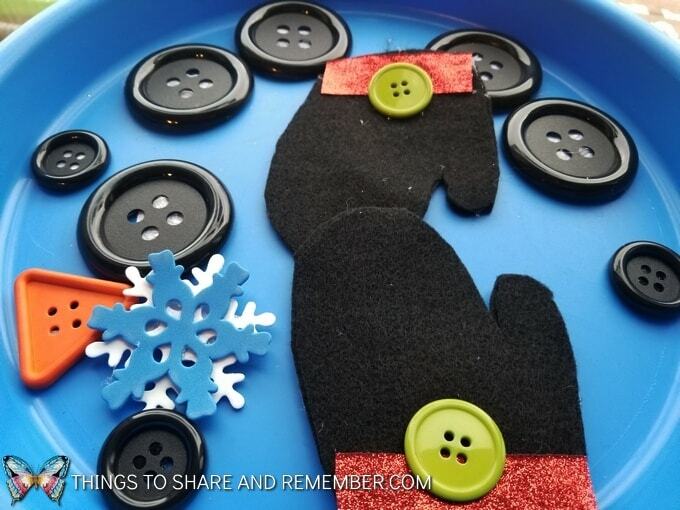 Choose a color of felt for mittens. 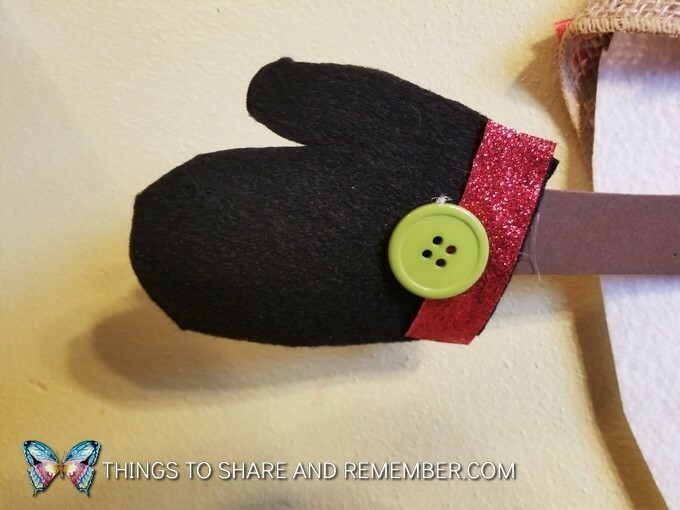 Cut mitten shapes from felt. Glue together and embellish as desired. From brown craft foam: cut strips for arms. Back with strips of cardboard for firmness. 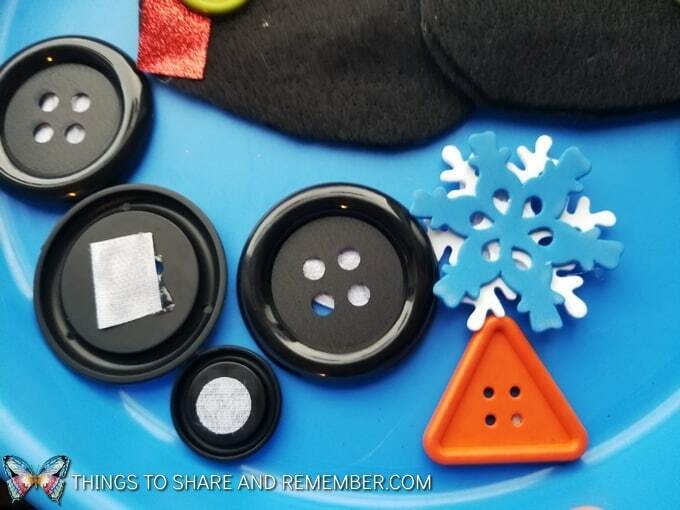 Cut pieces of Velcro (rough side) and hot glue to the back of the snowman buttons. 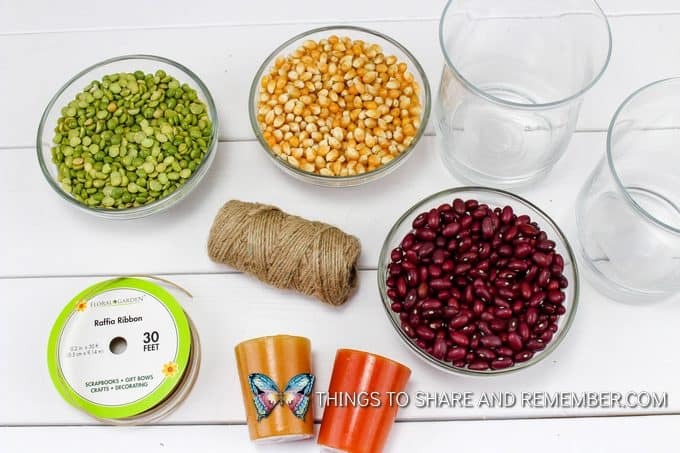 Make a scarf from fabric. 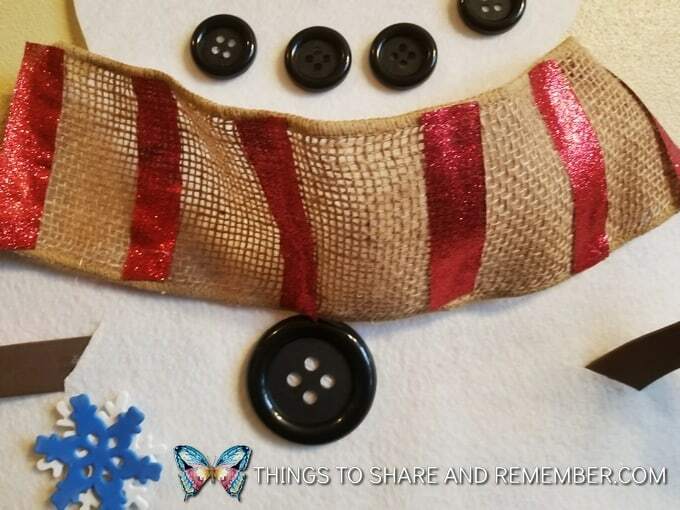 I used a length of burlap ribbon and decorated it with strips of ribbon. 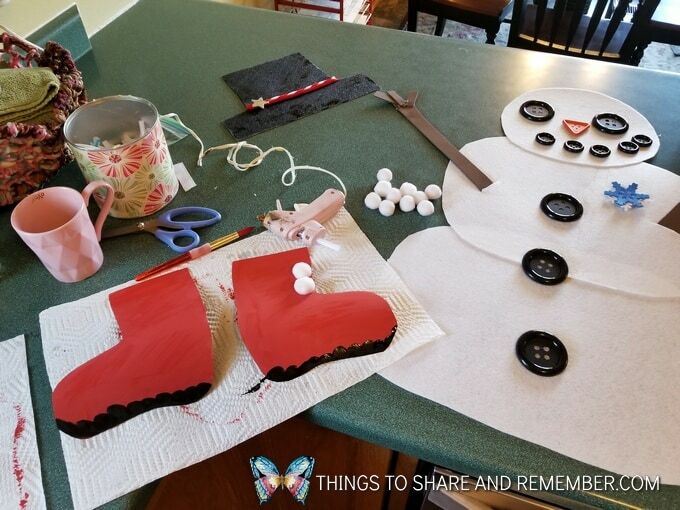 The scarf tucks behind the snowman. His boots. I freehanded the shape of the boots onto thin cardboard and painted them with acrylic paint. 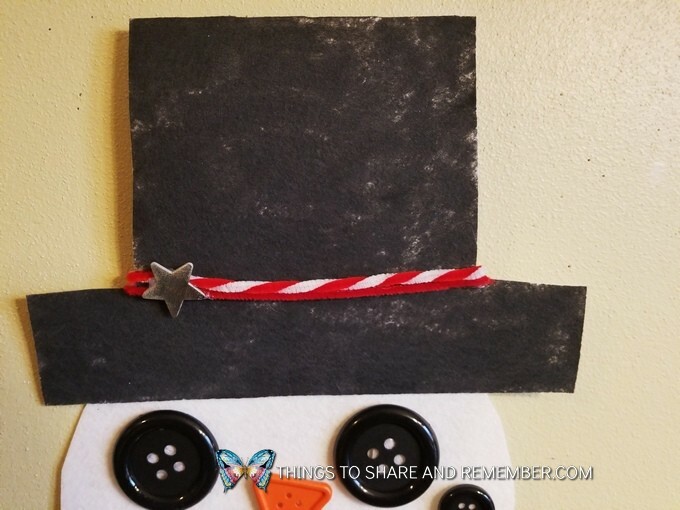 Frosty’s fancy hat made with felt, painted black and decorated with a wood shape star and pipecleaners. Here are his arms – brown craft foam backed with cardboard for firmness. 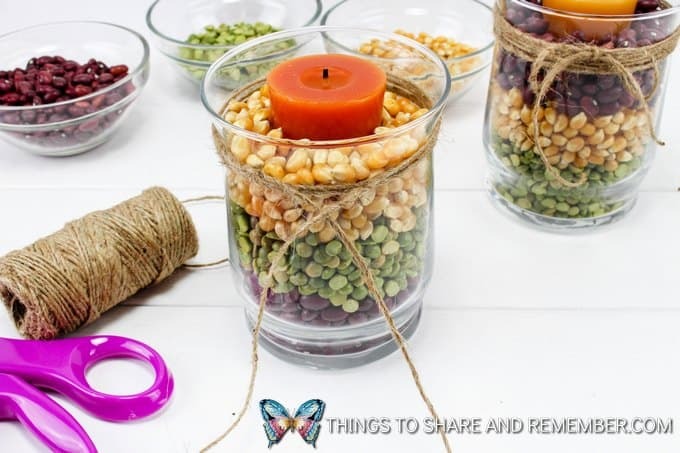 Hot glue them together. 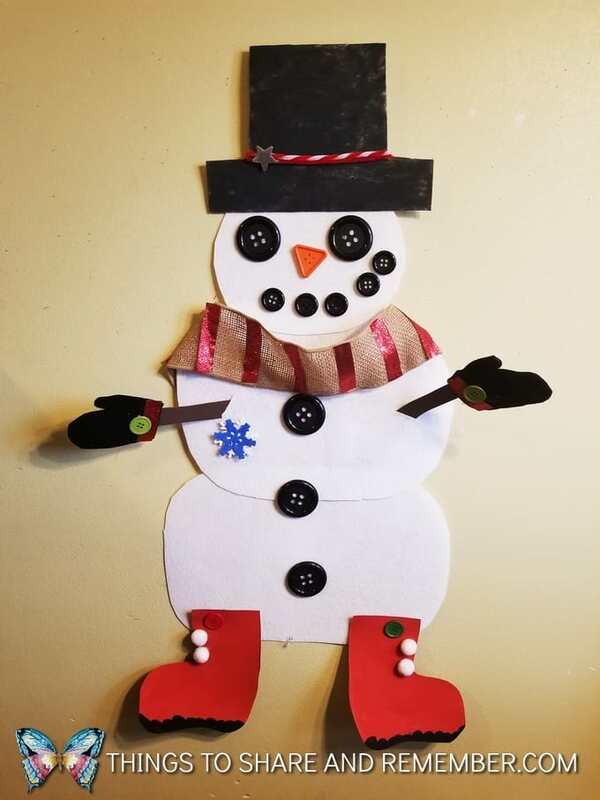 Even Frosty needs mittens – it’s cold outside! 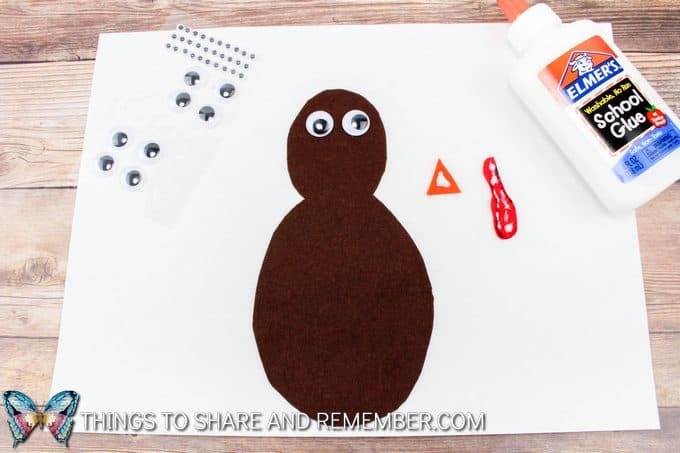 Glue together mitten shapes. Slide them on Frosty’s arms. Add a scarf. Keep Frosty warm and stylish. Just bits of Velcro hold the buttons on the felt. 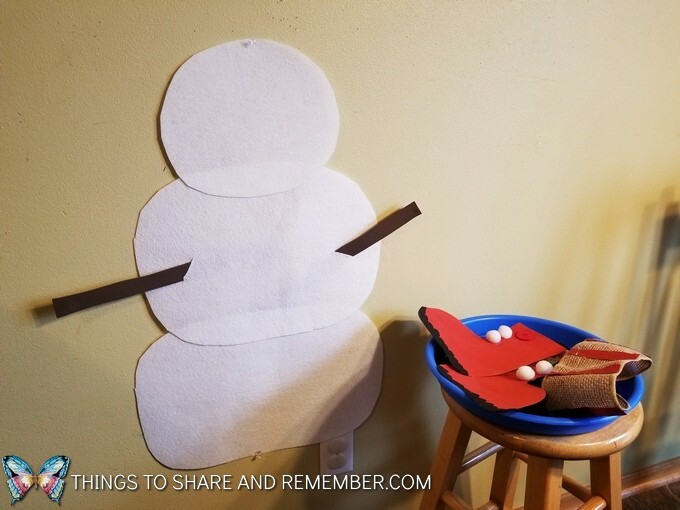 Take turns dressing up Frosty the Felt Snowman! Button eyes, button carrot nose, and button smile. 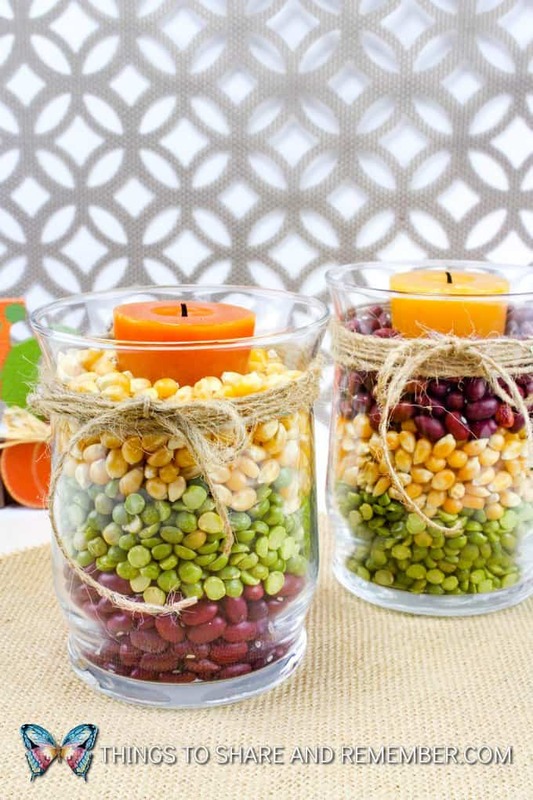 Bring Frosty indoors! 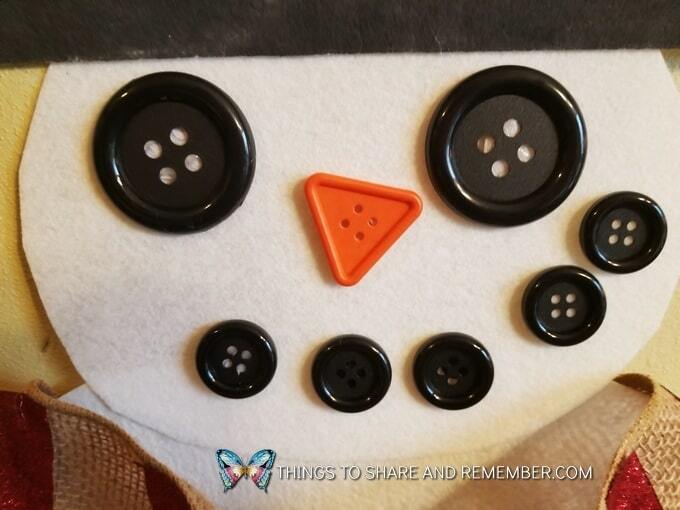 You will be warm and he will brighten your room with his button smile! Our leaves haven’t begun to change colors yet, but they will soon. 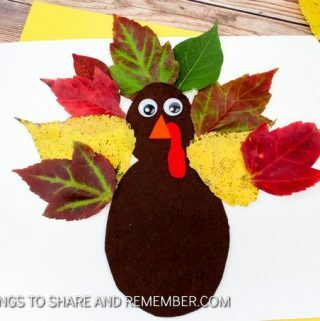 Making a Fall Thanksgiving Leaf Turkey picture would be a fun way to use colorful fall leaves. 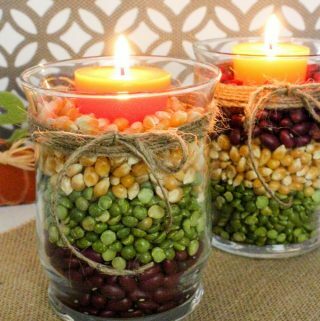 Sometimes leaves from shrubs and plants are even more colorful so be sure to check those too. 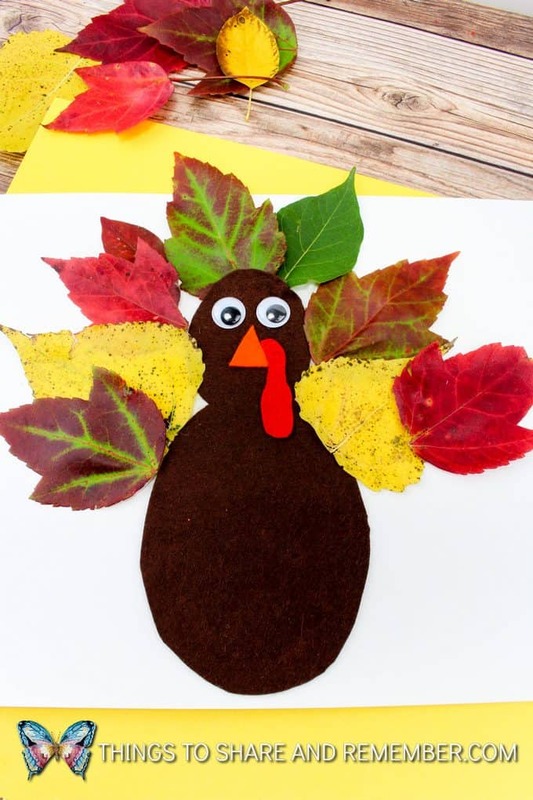 You can always use artificial leaves if the season doesn’t fall at the right time for a Fall Thanksgiving Leaf Turkey. Cut out a large turkey body about 9” tall or so. I cut mine out in the shape of a bowling pin, so it looks like a head and a body. Glue this on the paper. Attach 2 googly eyes on the head. 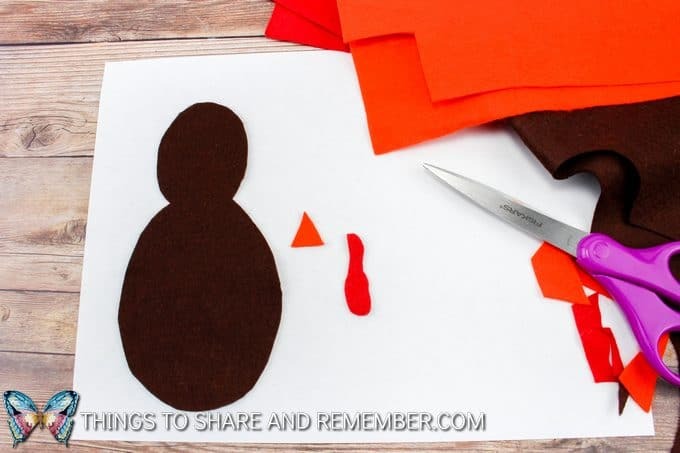 Cut out an orange triangle for the beak and glue on under the eyes. 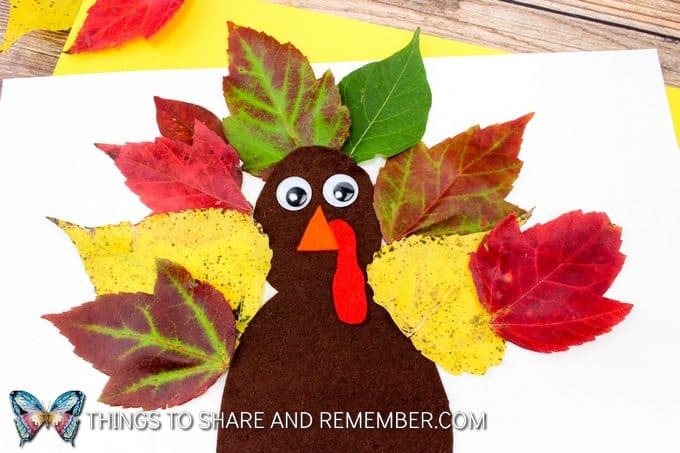 Cut out a red wattle and glue this on the side of the beak. 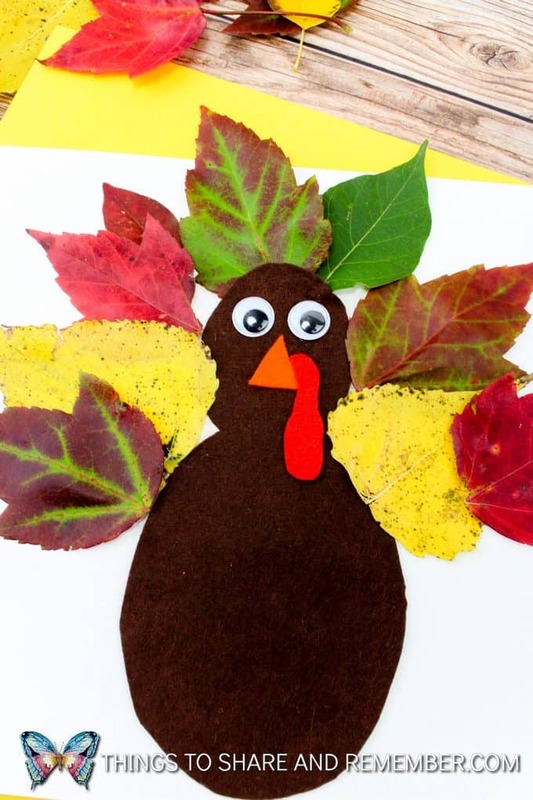 Glue leaves all around the turkey body in a fanned-out position so they look like the turkey’s feather. Let it set and dry for about an hour. 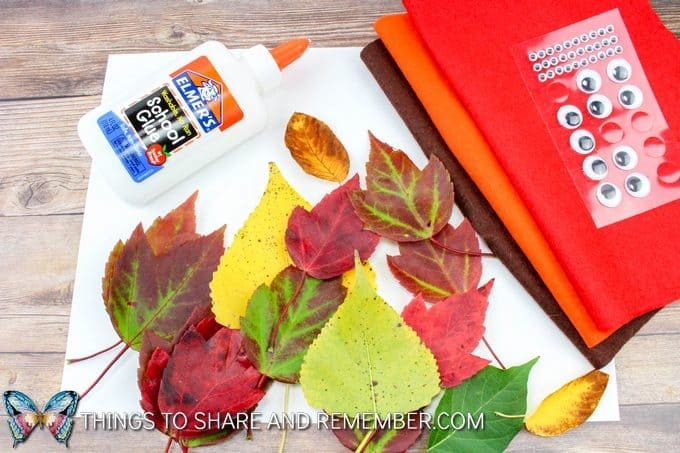 Fun and easy fall craft for kids!